“A man on trial on terrorism charges allegedly downloaded more than 2,000 “extreme right-wing” punk rock songs, a court has heard. A total of 2,043 tracks were found on a laptop taken from the home of Connor Ward in Banff, Aberdeenshire. 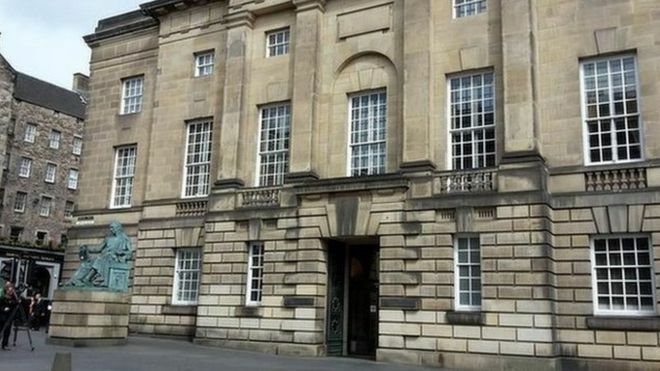 The High Court in Edinburgh has been told that weapons and material which could be used in bombs were found at properties linked to Mr Ward. The 25-year-old denies breaching the Terrorism Act. Some of the songs found on his laptop were composed by a group called Rahowa, the court heard. Jurors were told that Rahowa is an abbreviated expression used by far right-wing activists for “racial holy war”. Prof Matthew Feldman, 41, told prosecution lawyer Richard Goddard that he was asked to analyse material taken from a computer which belonged to Mr Ward. The academic, who specialises in studying far right-wing political movements, said he concluded the music contained content which was sympathetic to neo Nazism. He was giving evidence on the 10th day of proceedings against Mr Ward. The jury heard that as well as the songs, Prof Feldman found a 214-page copy of Mein Kampf by Adolf Hitler on the computer. It appeared to have been downloaded from a “white nationalist news portal”, he said. Prof Feldman said he also found a copy of The Turner Diaries, a book “once described by the FBI as being the bible of extreme right-wing activists”. A book called The Jew as Criminal was also discovered, with a preface by Julius Streicher – a leading figure in the Third Reich who was hanged at Nuremberg. Ward, a prisoner of HMP Grampian, has pleaded not guilty to the two charges.